JJohn L. Sullivan, "The Boston Strongboy"
Boxing, as so often in its history, appeared to be dead. The heavyweight champion of 1880 was 42-year-old, Englishman Joe Goss, who had won the championship in September 1876 when Tom Allen was disqualified for hitting a man when he was down. This may not have been accidental. A Joe Goss strategy was to trick his foe by placing his knee to the ground and inducing his opponent to hit him. Goss would do this several times in his upcoming bare-knuckle championship bout, May, 1880, against Irishman Paddy Ryan. Goss had not officially defended his title since the disqualification championship victory. He mostly toured and sparred 3-round exhibitions with gloves. It was illegal to bare-knuckle fight in all 38 American States. Many Americans viewed Canadian John J. Dwyer as champion because Goss was flavorless and would not fight, while Dwyer had a won a publicized and anticipated bare-knuckle bout in Pennsylvania. Dwyer did not view himself as champion because he considered boxing a shameful activity, but American boxing fans were starving for a heavyweight boxing champion that was willing to fight. John L. Sullivan was a 21-year-old Bostonian cult star unknown outside his region. He had gained local fame by defeating the regional champion with a dramatic first-round knockout. Jack Scannell was a tough Irishman, with scarred hands, who had served in the American military. Scannell was popular because his style was to throw hard punches from the moment a bout had begun and overwhelm his foe. Scannell was promoted as undefeated from the stage and would challenge anyone with gloves. 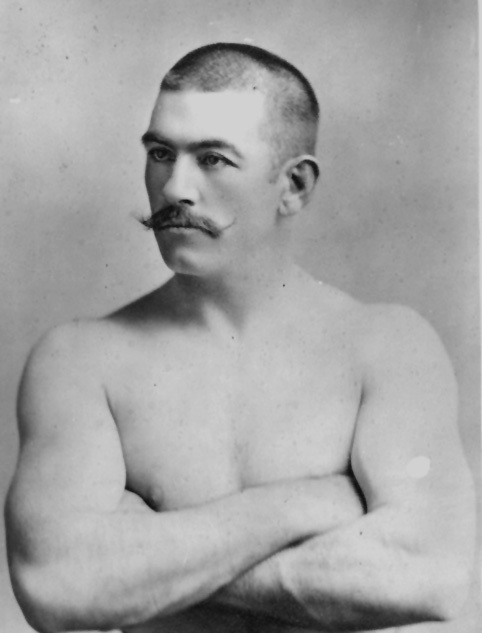 John L. Sullivan was a professional baseball catcher/pitcher who dabbled in boxing. He apparently had mixed results as a teenaged amateur. Sullivan gained confidence as he developed a strategy. When the local champ challenged anyone to fight, John L. Sullivan volunteered. Scannell had a rapid fan base that paid an undefined amount after each bout. (These bouts were entertainment and might include a singer, musician or comedian monologue.) Scannell began round one by appearing to overwhelm Sullivan with aggressive punches. Sullivan defensively blocked these punches and backed away. The undefeated Scannell had no idea this teenager was strategizing by controlling the action based on how he backed. Scannell aggressively pursued forward until Sullivan’s planned ambush landed a right punch to the jaw. Scannell’s momentum was moving forward – Sullivan timed his right punch as he stepped forward – and from there we have violent physics. A local legend was born as the Sullivan gloved punch knocked Scannell backward through the ropes, off the stage, until he landed unconscious onto a piano. Boston fans would have been the first throughout the world to be thrilled by early round heavyweight knockouts with gloves. There would be no knockdowns on this night as it was merely exercise and training - with a little pocket money - while Goss prepared for his upcoming bare-knuckle championship bout. Goss stood at 5’8 and 160+ pounds. The local 21 year-old challenger stood 5’10 and 180+ pounds. The younger Bostonian thrilled the crowd by dominating the first round. Sullivan landed left jab after left jab. The confused champion could not stop the left punch repeatedly popping him to the face. Sullivan had superior hand speed while the force of the left jab stung Goss enough so that he could not counter or respond. Sullivan must have been excited that he could easily dominate the heavyweight champion. The second round began much the same with Sullivan landing a hard left jab to the face. Goss attempted a right punch that Sullivan easily blocked while stinging the Champion with another left jab that landed to the face. A frustrated and angry Goss stepped forward to stand toe-to-toe and trade punches with the brash local challenger. Sullivan won the exchange with hard, fast left jabs. At the same time Sullivan was strategizing his planned ambush. The crowd was cheering enthusiastically when the local kid added to his growing legend. A tired Goss’ momentum was moving forward – Sullivan timed his right punch as he stepped forward – and from there we have violent physics. The challenger’s gloved punch landed to the side of head with the heavyweight champion collapsing to the ground. The Boston crowd stood and roared its approval. There was no "10 count" because it was only a three-round exhibition. The master of ceremonies, Thomas Early, stepped onto the stage. Early then approached the fallen English pugilist who lay without movement. Early assisted the heavyweight champion to his feet and had him sit down on a stool. Goss was seriously dazed while allowed the time he needed before continuing the bout. The locals applauded at full volume throughout this delay. The challenger must have been exhilarated by the crowd’s love and approval, but for appearances feigned regret that he had "accidentally" injured the famed pugilist. After a 10-15 minute delay Goss was still dazed and unable to continue. The popular local challenger had knocked out the heavyweight champion within two rounds. The 1,800 Bostonians continued to wildly cheer as Sullivan waved to them and acknowledged their appreciation. Christopher James Shelton is a product of the American West Coast. He has lived in Los Angeles and San Ysidro, California, Tijuana , Mexico, and currently resides in Phoenix, Arizona. His research discovery credits include 19th century pugilists George Godfrey, Professor Hadley, Tom Hyer, John L. Sullivan and Jake Kilrain. Family interviews, mixed with historical research, include lightweights Jack Britton and Billy Hawkins. Shelton conducted the final interview with legendary Phoenix manager Al Fenn, and asked candid questions about George Foreman and H.I.V. with former heavyweight champion Tommy Morrison. HIs favorite historical article, “124-year-old woman challenges John L. Sullivan for the title," recounts the life story of a feisty 19th-century female slave named Sylvie Dubois.